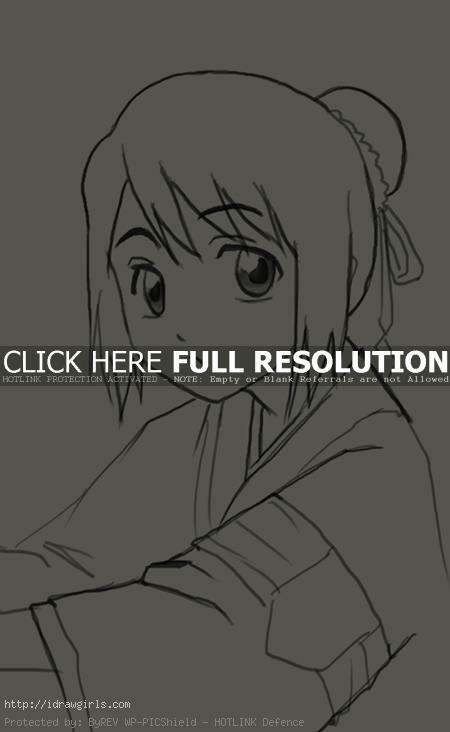 How to draw Momo Hinamori from Bleach Manga. Learn basic drawing technique for Manga and Anime from step by step basic drawing lesson. In this tutorial you will learn to draw a Manga character Hitsugaya Toushiro with basic instruction for beginners. Whether you are a beginner or pro, the easiest way to draw is to observed your subject then break it down into simple shapes. I usually start drawing with basic geometry shapes to construct the subject’s head and body. By following this process, you will find drawing is lot easier. The key is to get the shape and proportion as accurate as you can in the beginning. Also make sure the shape of eyes, nose and mouth place in the right spot. I usually start of using basic egg shape as a base for character’s head shape, then next step would be figuring out the next geometry form to fit into the image. Momo Hinamori ,雛森 桃, is the lieutenant of the 5th Division, formerly under captain Sōsuke Aizen and currently under captain Shinji Hirako. Hinamori has brown eyes, and wears standard Shinigami robes with her black hair pulled into a bun held in a tied cloth. When in her Shinigami robes, she wears the 5th Division’s lieutenant armband. Hinamori’s main pastime activities are reading and drawing. Due to her talent in drawing, she has overseen work for book illustration in the Shinō Academy. Hinamori is generally an upbeat, easy-going and friendly girl. She has a strong friendship with Tōshirō Hitsugaya, whom she grew up with. Below are step by step how to draw Momo Hinamori. Step one, I drew a basic circular shape for her head. Step two, I then drew her eyes, nose and mouth. Step three, I then added her hair style and her kimono. Step four, I drew additional bun on her head and added more detail to her kimono. Step five, I drew darker line onto the existing drawing to finalize the image.